Aston Villa's staff could face compulsory redundancy as the club prepare for relegation from the Premier League to the Championship. Saturday's loss to Bournemouth all but sealed Villa's fate. The club say "every effort" will be made to offer voluntary redundancy. 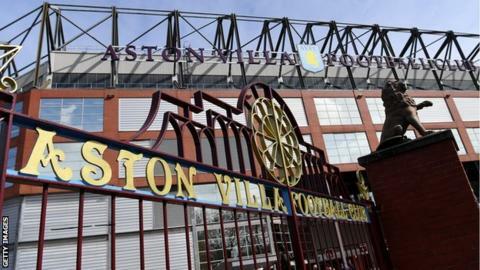 Villa added: "The objective is to secure a sound financial platform from which the club can rebuild. We recognise this is an extremely difficult time for all staff." The club statement described the move as a "headcount reduction". Villa have 16 points from 33 games and have been bottom of the table since November. They have been without a first-team manager since Remi Garde's departure on 29 March. Villa's board plans to meet on Wednesday to discuss the shortlist for Garde's replacement. BBC Radio 5 live's Pat Murphy reports the leading candidates remain former Manchester United manager David Moyes, ex-Leicester boss Nigel Pearson, Hull boss Steve Bruce, Ipswich manager Mick McCarthy, Burnley's Sean Dyche and Preston boss Simon Grayson.